A 100-year-old picture of a match between Kent and Lancashire has been sold for £680,000 - the most that has ever been paid for a cricket painting. Kent County Cricket Club (KCCC) auctioned Albert Chevallier Tayler's 1906-07 work at Sotheby's in London. It was bought by a charitable foundation run by Andrew Brownsword, the chairman of Bath Rugby Club. Sotheby's said the sale price was a record for a cricket painting and for one of the artist's works. 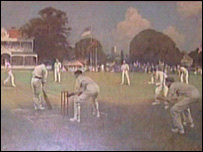 The oil-on-canvas picture, showing a match played at Canterbury, has been hanging at Lord's cricket ground in London because KCCC could not afford to insure it for display at its own St Lawrence Ground. The club does however have an exact replica of the original artwork. Carl Openshaw, KCCC chairman, said the painting was sold to help safeguard the long-term future of the club. But he added that it was the "ideal outcome" for the painting to have been bought by Mr Brownsword. "This unique painting will in the short-term at least continue to hang at Lord's where it can be seen by future generations of cricket lovers." Sotheby's said Mr Brownsword's foundation was active in trying to keep "important British paintings in the public eye in Britain". Its sale catalogue said the painting was regarded by some as "the ultimate example of this genre". The guide price at Sotheby's was £300,000 to £500,000. Albert Chevallier Taylor was 44 when KCCC commissioned him to do the painting in celebration of the club becoming county champions for the first time. The match he depicted was played in August 1906 and saw Kent trouncing Lancashire by an innings and 195 runs.